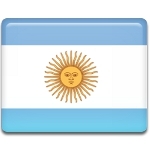 National Sovereignty Day is celebrated in Argentina every year on the fourth Monday in November. This is a national holiday, that is celebrated since 2010. The first mentions about National Sovereignty Day date back to 1954, when José María Rosa proposed to establish this holiday. He chose an important historical event, that deserved commemoration. It was the Battle of Vuelta de Obligado, fought on November 20, 1845. During the battle a small Argentine army led by Juan Manuel de Rosas stood against an Anglo-French navy, that broke into the Paraná River. The battle ended with Argentinian defeat, but France and Britain also suffered great losses, that eventually led to the bargaining trade and signing of a peace treaty. Rosa's proposal about the establishment of a commemorative day for Juan Manuel de Rosas was approved only in 1973. In 2010 President of Argentina Cristina Fernández de Kirchner made her own proposal to increase the number of holidays in Argentina. National Sovereignty Day was turned to national holiday, and its first official celebration took place in 2010.